On Tuesday, November 13th the Institute for African Studies, in co-sponsorship with the Constituency for Africa (CFA), hosted a series of panel discussions on opportunities, challenges, and recommendations for U.S. Africa policy. Panelists highlighted topics such as peace and security in Africa, strategies for engaging the diaspora in addressing health challenges in Africa, the next generation of leadership and recommendations for the African Diaspora Youth Summit, and trade and investment. 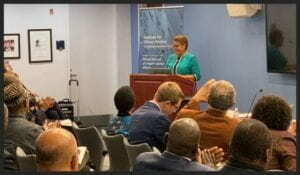 The keynote address on U.S. Africa policy was presented by newly re-elected Congresswoman Karen D. Bass (D-CA), Ranking Member of the House Subcommittee on Africa. The conversation was moderated by Reuben E. Brigety II, Dean of the Elliott School. Click Here to view watch the forum.